Suppose you have got some Flash videos in FLV format, and you want to extract the audio content off FLV video files for play back audio file on your MP3 player, but get no solution to do this. So, you need a way to solve the problem. That is the purpose you’re here. This guide would help you solve this problem easily and offer you satisfactory answer, by using a professional FVL to MP3 converter program or a free FLV to MP3 converter online. Leawo Video Converter is a tool for converting FLV to MP3 so that users can play the file on Windows Media Player or MP3 players easily. 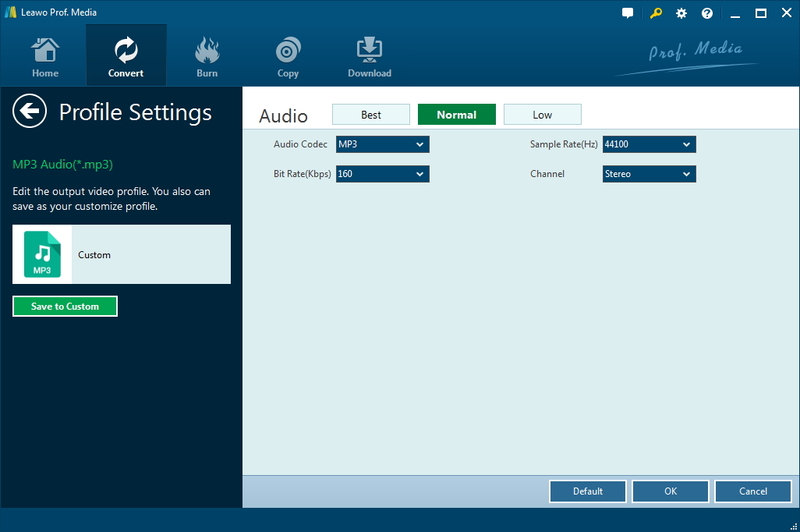 The professional FLV to MP3 converter allows you to set the output MP3 parameters like bitrate, codec, channels, etc. 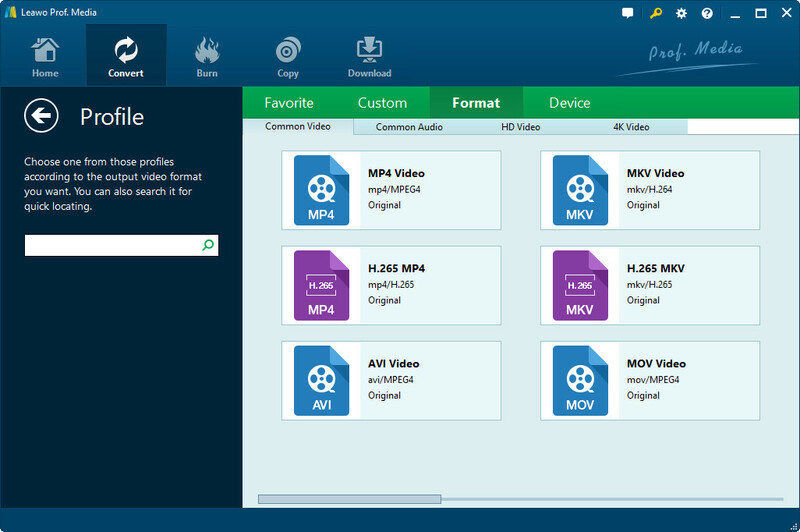 With just a few clicks, you can convert FLV files to MP3 files at a high speed in batch. The simple and friendly interface makes the program very easy to use. Download and install Leawo Video Converter on your computer, and check the following steps to know how to convert FLV videos to MP3 audios. Kick off Leawo Video Converter to enter the main program interface, and click “Add Video” button on the sub-menu to load your source FLV video files. Click the drop-down box next to the “Add Photo” button. On the drop-down list, select “Change” option. Then on the popup Profile window, select “MP3″ from “Format” column as output format. Note: If you need, you could click the “Edit” button on the drop-down profile setting box to adjust detailed audio parameters including audio codec, bit rate, channel and sample rate. Click the big green “Convert” button on the sub-menu bar next to the format setting drop-down box. Then, on the popup sidebar, set output directory. After setting output directory, click the “Convert” button right below. Leawo Video Converter would start to convert FLV to MP3 immediately. Note: For Mac users, Leawo offers Mac FLV to MP3 Converter for easily converting FLV to MP3 on Mac in only a few clicks. If you are looking for a method that helps you convert FLV to MP3 for free, you can give an online FLV to MP3 converter a try. Zamzar Free Online Converter is one of those online converters. After entering the online page, you can follow the guide within to convert FLV to MP3 online. The steps are easy to follow. Let’s take a look. There are two ways for you to import source FLV files into the free FLV to MP3 converter online. You can either choose files from your local hard drive, or add files from URL. To convert FLV to MP3, you need to choose “MP3″ as output format under “Convert files to” drop-down list. An email address is a must-have as after the conversion finishes, the only way for you to receive converted files is by mail. Therefore, you need to enter your correct email address, otherwise you will not get the converted files. Click “Convert” button to start converting FLV to MP3. Online FLV to MP3 converter does allow users to convert FLV to MP3 free, but it requires files uploading and downloading, which means you need to access to internet when you are using an online FLV to MP3 converter. It is probable that your video content will be exposed to the public, which will cause privacy leak. Video converter program, on the other hand, is much safer in protecting users’ privacy. Let’s take a look at a thorough comparison between Leawo Video Converter and Zamzar Online Converter. 3D video formats: 3D MP4, 3D WMV, 3D AVI, 3D MKV, 3D YouTube video, etc. Video: AVI, XviD, DivX, MPG, FLV, MP4, MOV, 3GP, WMV, SWF, etc. Audio: WAV, WMA, MP3, OGG, M4A, AAC, etc.